Since its inception in 1977, the Western Texas College Foundation, a 501(c)(3) nonprofit corporation, has served Western Texas College by soliciting, receiving, and administering gifts and grants for student scholarships and other campus activities. The WTC Foundation enriches the mission of Western Texas College by providing financial support and enabling student success through increased opportunities and community involvement. 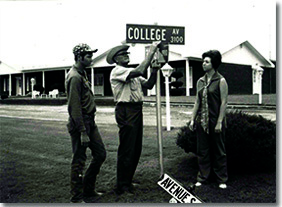 The Western Texas College Foundation serves Western Texas College, its students, faculty, staff, community, and service area by soliciting and administering gifts and grants from individuals and institutions for charitable, educational, and scientific purposes […] the corporation collects and disburses monies for student scholarships, educational and cultural activities, and campus facility improvement and development, and provides selective and judicious financial assistance to endeavors that enhance the quality of life for all people who are served by Western Texas College. The Western Texas College Foundation (WTC Foundation) was founded on November 14, 1977 under the name “WTC Scholarship Foundation.” Its primary purpose was to fund scholarships for WTC students. In February of 1982, the foundation was granted 501(c)(3) tax exempt status by the IRS. The Board of Directors changed the name to “Western Texas College Foundation” in March of 2003, plus modified and expanded the purpose of the Foundation. Today, the WTC Foundation continues to support a large scholarship program, educational and cultural activities, and campus improvement and development.